US President Donald Trump has shrugged off protests planned across the UK ahead of his arrival on Thursday, claiming he is very popular in Britain because of his hardline stance on immigration. Trump will spend four days in the UK from Thursday, where he will meet with Britain’s Queen Elizabeth II and Prime Minister Theresa May. 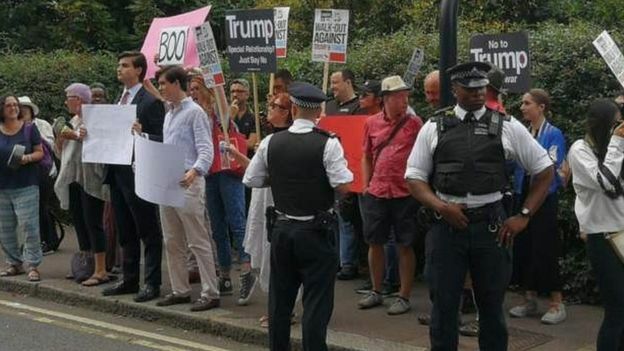 Although he will visit the US ambassador’s residence, he is largely avoiding central London, where the largest protests are expected Friday. May was the first head of government to officially meet Trump as president, in January 2017. It was during that trip to Washington that she invited him to the UK. Trump postponed his trip several times as a petition to block him from entering the UK gained so many signatures that it was debated in parliament. The UK’s speaker of parliament made clear that Trump, because of his values, would not be invited to address MPs. The petition against Trump claimed an official state visit would be embarrassing for the Queen. Trump is technically on a lower-level working visit this week. He again postponed his visit in January this year after remarking that the relocation of the US embassy in London was a “bad deal” made by President Obama, and that he was not interested in cutting the ribbon at the opening.